Our twin EVA operation is underway and our today’s EVA was focused on the sampling of gypsum. Like halite or sodium chloride (NaCl) that I wrote about in my previous science post, gypsum or calcium sulfate (CaSO4.2H2O) is another form of evaporite which is significant from astrobiological perspective. 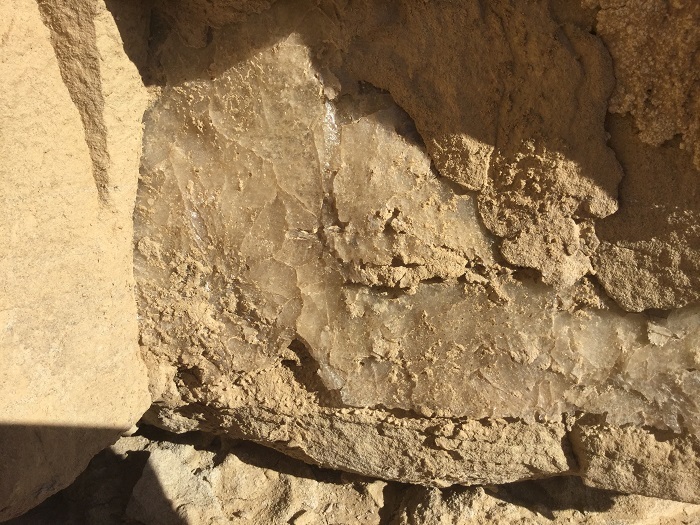 Gypsum can entomb biosignatures for a prolonged period of time due to its ability to retain water and the transparent surface makes the sunlight penetrable yet limits the high UV radiation. These features can allow microorganisms to refuge and sustain inside the microhabitat of these evaporite crystals during crystallization in the ancient times. Today we went past Factory Butte and collected multiple gypsum samples from fine and rough sandstone, shell, and soil. These gypsum deposits belong to the Cretaceous period (between 145.5 and 65.5 million years ago) which is last period of Mesozoic Era. 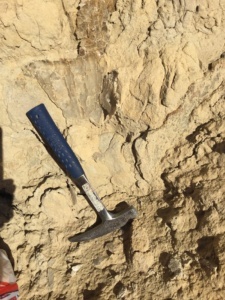 Gypsum is widespread in this particular site and related to the weathering. We intend to perform microbiological analysis of these ancient evaporites.